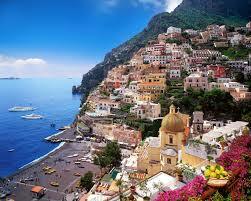 Where the endless azure sky meets the sea, high above the Amalfi coast, is where you’ll find Casa Positano. The house is only accessible on foot. 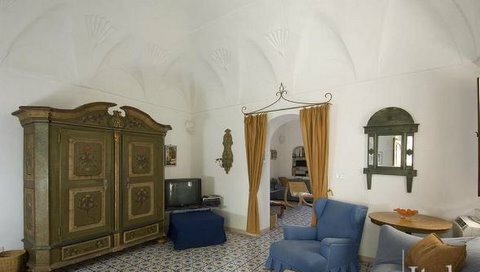 A typical, domed house with a stunning view of the sea and of the villages of the Amalfi coast The oriental feel of the house’s entry makes a mysterious impression. It seems almost as if you were walking through an ancient wheelarch doorway into an enchanted refuge. In fact it is as if a whole new world were opening up, with a breathtaking, unhindered view of the Gulf of Salerno and its coastal villages. 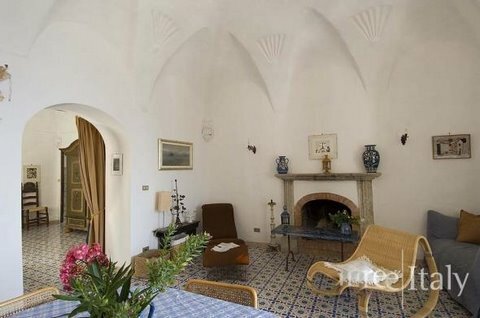 Inside the house, the cupola architecture is continued in the vault-like ceilings – plenty of Mediterranean air to breathe both inside and outside. The apartment is decorated in friendly style. An antique stone fireplace brings back memories of days gone by. 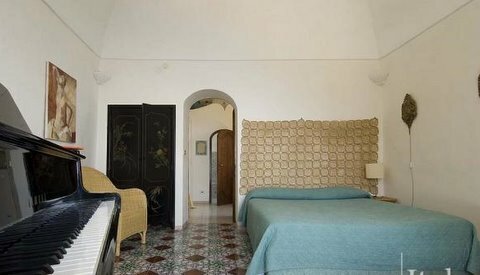 The blue and green tones of the sky and the sea are reflected in the colour scheme and the decorative Mediterranean tiles. f you feel like getting lost in a book or the endless waves of the ocean, the covered terrazzo is the perfect place for quiet hours.